Bluegrass Band Contest – Saturday June 4, 2016, 4:00 p.m. RAIN or SHINE! Come on out! Bring lawn chairs! Join us for the third annual Bluegrass Heritage Foundation and Dallas Heritage Village Front Porch Showdown Bluegrass Band Contest! At 3:30 p.m., the bands will draw numbers to play in one 15-minute slots (running from 4p until 6:00p), and at 4:00 p.m., we hit GO! Each band will have 15 minutes to take the stage, play a few songs, entertain, and get out of the way before the next band begins. Contest starts at 4:00 sharp with the last band finishing at about 6:00. Winners announced about 6:15. You can download the rules of the band contest here. Plus – we have two prizes chosen by the Dallas Heritage Village staff – Best Dressed Bluegrass Band ($100) and Village Favorite ($100). These prizes should help to make things even more fun! Our bluegrass band contest will be held RAIN or SHINE. If it’s dry, we’ll be on the stage in the middle of the old-time main street. If it’s wet, we’ll be inside the nice pavilion just up the hill from the main street buildings. So don’t let the weather slow you down! 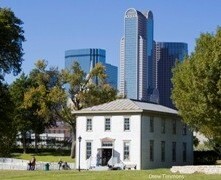 Bring your lawn chairs, blankets, and picnics and have a great day at Dallas Heritage Village! Enjoy a few highlights of the 2014 Front Porch Showdown below, courtesy of David Seay Productions. Bring your picnic, lawn chairs, or blankets and strap in for a wild ride! Everyone will play acoustic instruments into a microphone – no amps or fancy gear permitted! Every person with a paid admission will receive a ballot, and the audience picks the winner! Bring your friends and family and vote for your favorite band! There will be FOOD TRUCKS, so come hungry! 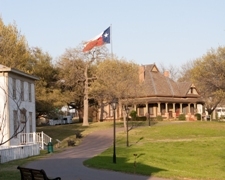 Admission to Dallas Heritage Village is only $10 in advance or $12 at the gate and includes all historical buildings and exhibits. Kids 12 and under get in free! See more about the contest on Facebook. 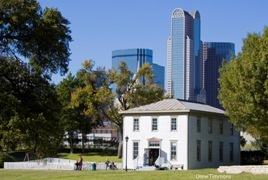 Our setting for the day is the beautiful Dallas Heritage Village, a shady, tree-lined 20-acre park with authentic 19th-century pioneer and Victorian homes and commercial buildings in the shadow of downtown Dallas. It’s the perfect place to JAM ALL DAY! 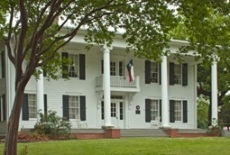 Come early, bring the whole family, and check out the historical exhibits and buildings.